You will find a number of picturesque villages in the Wachau region along the Danube, but one of my favourites is Dürnstein. The tiny town on the banks of the Danube gets its charm from a mix of authentic historic buildings, its river-side location and good old Austrian hospitality. 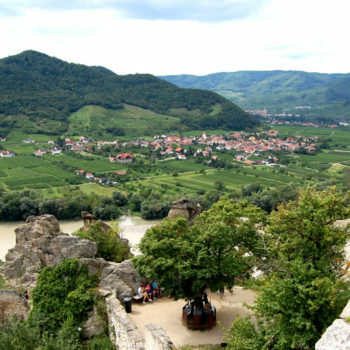 Dürnstein is as taken out of a medieval novel. Dürnstein clings on narrow strip on the north bank of the Danube in Lower Austria. The small town has taken its name from the castle which occupies the cliffs above. 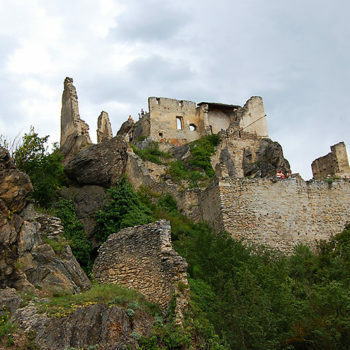 The town is luckily much better preserved than the castle, which today only consist of a few crumbled walls and towers. 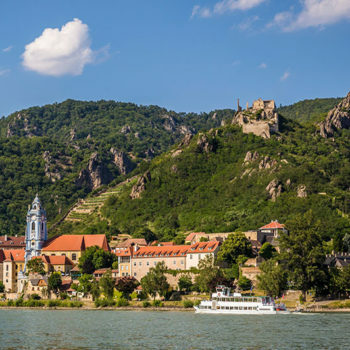 Moreover, Dürnstein, with its location in the middle of the wine and fruit region Wachau, is a popular destination for both foreign and Austrian tourists. 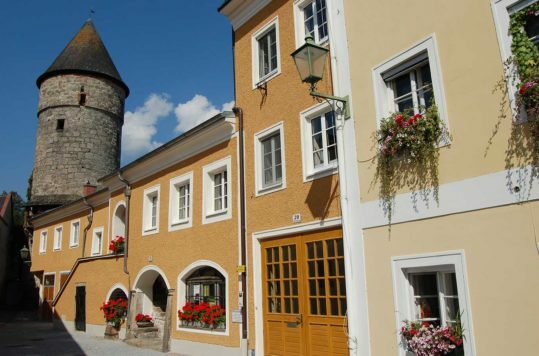 This well-preserved medieval town is definitely worth visiting a day or two. 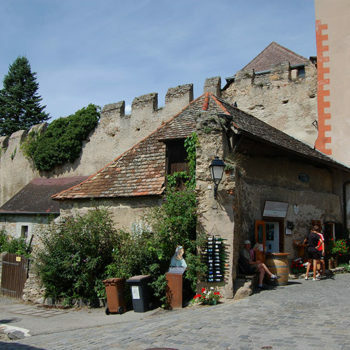 Narrow cobbled streets surrounded by historic buildings are hidden behind a fortification wall. As you stroll through the towns main gate “Kremser Tor”, it’s almost like leaving this century and moving backwards in time. Well, if you manage to overlook the cars. From Kremser Tor the Hauptstrasse (main street) passes through the small town and along this street you also find most of its shops. For the best view of the Danube River head for the small viewing platform right outside the entrance to the Hotel Schloss Dürnstein. Or simply stroll down to the river bank by turning right outside the eastern city gate (Kremser Tor) and following Anzuggasse down towards the river along the wall. The blue-white church tower, visible from most of Dürnstein, belongs to the Stift Dürnstein monastery. Built in Gothic and Baroque style between 1400 and 1700, the monastery occupies a large chunk of the town. You can either visit the monastery on your own or on guided tours for a few euros. At first glance, Dürnstein may seem a little kitsch with all the souvenir shops crowded with hordes of tourists on foot or on bicycles. Nevertheless, do not be fooled by all the souvenir shops. Look past all this and you will also notice the history which creates all the buzz. 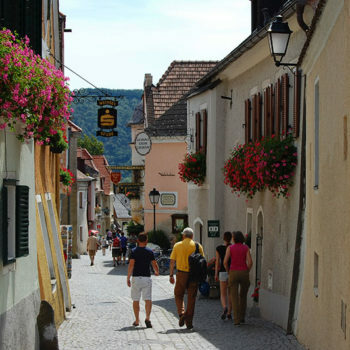 After all, Dürnstein was incorporated into the UNESCO World Heritage Sites in 2000. I have visited Dürnstein during all seasons, and all seasons have had their different highlights. During the July and August holidays, the place is packed. In May and June, the number of tourists is far less, and it is easier to enjoy the atmosphere. Most visitors are day-trip tourists. Thus, in the afternoon it usually quiets down a fair bit. Dürnstein old town with its 340 inhabitants is a small place and you can leisurely explore the tiny town, as well as enjoy a snack or a refreshment within just 2-3 hours. 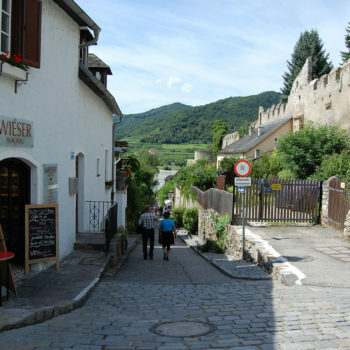 Arriving in Dürnstein, you cannot On a cliff above the town the ruins of a medieval castle. The castle ruins are not worth a visit in themselves. Nonetheless, the combination of some truly amazing views and the lovely path through the vineyards, your effort will pay dividends. On another footnote, it was a Swede who contributed to the destruction of the castle, when General Torstensson and his army blew up the castle in 1645. After this nobody cared to rebuild it. Dürnstein, or rather the castle Dürnstein also left a historic and political footprint even further back. From December 1192 until March 1193 the English king Richard Lionheart was imprisoned in the castle. Well, that is what the legend says. Either way, when you stand in the castle, you quickly understand why this place was chosen for city building. The view of the Danube Valley is simply phenomenal. 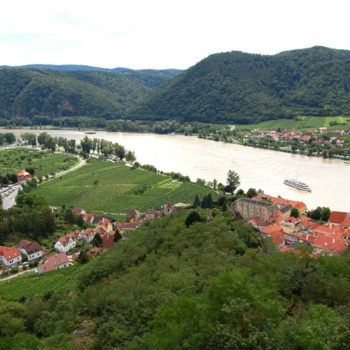 One cannot fail to notice that Wachau is one of Austria’s premier wine regions. Wherever you look, you’ll see vineyards. Vines are not restricted to the hillsides outside the town but are also used as ornamental plants inside the town as well. 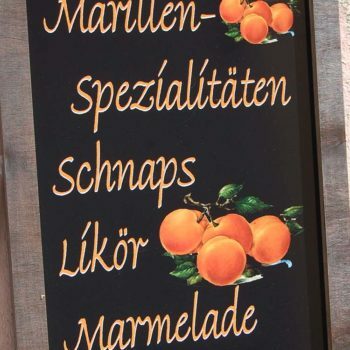 Farmers in the area around Dürnstein also cultivate different varieties of fruit, one of the most popular being apricots (Marillen in German). Apricots are sold as fresh fruit but are also made into liqueur. 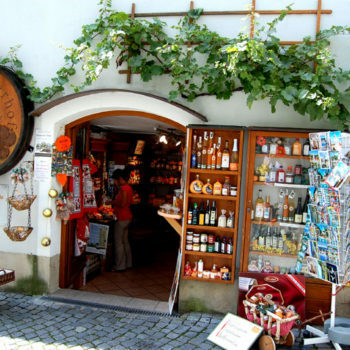 In Dürnstein and the surrounding farms you can buy locally produced snaps and liqueurs. Or you can choose mass-produced from larger distilleries in the supermarkets. If you’re not sure what to choose, most shops offer tasting of their products.